So your situation is that you’re moving your home or your business to or from American Fork. And you need a professional moving service to transport your goods to your new location. And they need to be experienced, reliable, efficient, excellent, and affordable. And they also need to be insured, bonded, and federally licensed. And it would also be good if they were a local moving company, and not part of a sprawling national franchise. Someone with Utah values and traditions. Someone with their roots in this great state. There is a professional moving company that has all of those qualifications and many more: Moving Connections. With more than thirty years of moving Utah households and businesses, Moving Connections has emerged as a top notch moving service. And whether you’re moving a very modest amount of household items, or you’re involved in a total corporate American Fork relocation, Moving Connections has personnel experienced in all aspects of these types of transitions. And we have the equipment and skills to perform your American Fork transition quickly, efficiently, and safely. If Moving Connections is moving you to American Fork it's a perfect time to begin to utilize the many resources and bounties of American Fork. For example click on the picture to the left to go the Moving Connections 'Support - Advice - Assistance' page and discover American Fork for the first time. Once you are on the 'Support - Advice - Assistance' page go ahead and open the .pdf link found there and tape the list of emergency and useful phone numbers on your refrigerator. 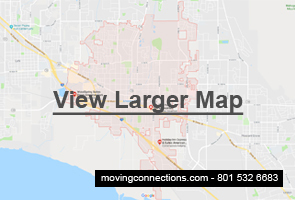 Moving Connections has gone to great pains to find those links and connections to integrate you quickly into American Fork life. If you’re looking for a local residential mover for your American Fork move, then give Moving Connections a call. One of our cheerful representatives will be happy to give you a move quote or answer any technical questions you might have. After all, moving can be a headache, but that’s why our full service moves are the most popular service we offer. It takes the strain – both physical and mental – off of you at this trying time. Of course, if you feel confident in your packing abilities, you can do much of the packing yourself and a Moving Connections professional moving crew will pack and load the larger and more fragile items. This will save you money because it will reduce the labor time of our American Fork moving crew members. Also, if you want to save the most money, you can schedule an American Fork “Labor Only” move. This means that you would provide your own truck and driver, and our professional moving crew would just pack and load your vehicle, and you would drive it to your new location and unload it there yourself. Sometimes people want to save all the money they can, and a “labor only” move can give you some advantages that way. When you schedule a “labor only” move, you provide the truck and driver, and our men simply pack your goods and load them onto the truck. The rest is up to you. Since Moving Connections charges only for labor and driving time, plus packaging materials – no taxes or surcharges of any kind – this can save you some money. And because Moving Connections hires only experienced moving crews, you know you’re getting a top tier service when it comes to expertise and efficiency when you hire our personnel. Of course, if you still want the peace of mind that comes with a full service move, you can do that with Moving Connections, too, because that is by far our most popular service. Or if you just want to package some of the less fragile and lighter items and save some money that way, you’re welcome to do that also. And since Moving Connections carries a full line of boxes, tape, stretch wrap, etc., at very competitive prices, we can provide those packing materials, too. Moving Connections is a business, and so we understand your business needs. Whether your American Fork business move is just an office move down the hall or a complete American Fork corporate relocation, Moving Connections has the solution for you. Our moving company is federally licensed with a federal motor carrier number. Moving Connections is also bonded and insured. As a business owner or manager, you know what that means, and that should give you a lot of peace of mind when contemplating the choice of an Alpine local moving service. Moving Connections will also do its best to keep you up and running while performing your American Fork local move.